Although better known for its sunny skies, Los Angeles suffers devastating flooding. This book explores a fascinating and little-known chapter in the city's history—the spectacular failures to control floods that occurred throughout the twentieth century. Despite the city's 114 debris dams, 5 flood control basins, and nearly 500 miles of paved river channels, Southern Californians have discovered that technologically engineered solutions to flooding are just as disaster-prone as natural waterways. Jared Orsi's lively history unravels the strange and often hazardous ways that engineering, politics, and nature have come together in Los Angeles to determine the flow of water. He advances a new paradigm—the urban ecosystem—for understanding the city's complex and unpredictable waterways and other issues that are sure to play a large role in future planning. 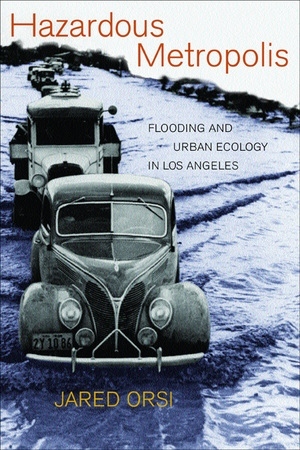 As he traces the flow of water from sky to sea, Orsi brings together many disparate and intriguing pieces of the story, including local and national politics, the little-known San Gabriel Dam fiasco, the phenomenal growth of Los Angeles, and, finally, the influence of environmentalism. Orsi provocatively widens his vision toward other cities for which Los Angeles may offer a lesson—both of things gone wrong and a glimpse of how they might be improved. Jared Orsi is Assistant Professor of History at Colorado State University, Fort Collins.